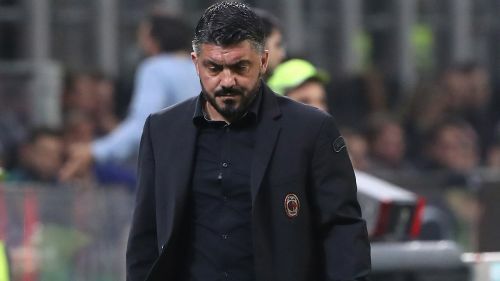 AC Milan head coach Gennaro Gattuso insisted he was not worried about his job, saying his focus was on turning his team's season around. The Serie A outfit slumped to a 2-1 loss at home to Real Betis in the Europa League on Thursday, further increasing the pressure on Gattuso. Milan are second in Group F, but they have struggled in the league, winning just three of eight games to be 12th in the table. Gattuso, who took charge in November last year, hit out at any suggestions he was focused on surviving as coach. "Do you think in this moment I am thinking about saving my a***? I'm not worried about my job or about how to save my a***," he told a news conference. "I'm only focused on how to sort the problems of my team, if the club will give me the chance to continue here. "As I already said after the performance, as the manager I have many things to be worried about and that need to be fixed. "I have a difficult job ahead of me and I feel responsible for our bad performance." Milan's next outing sees them host fifth-placed Sampdoria in the Serie A on Sunday.